It's nice to get out of the classroom once and awhile to test ourselves out in the bigger world. We don't normally sit in a circle at school, even though we call it "circle time." Some of us dressed up in fancy clothes in honor of the day. And while we watched the professional dancers rehearsing through the windows, making sure to keep especially quiet, we were really there to explore new ways to move our bodies. What fun it was to have a wall of mirrors in which to watch ourselves from across the room . . .
. . . or right up close to see what it looks like when we do this . . .
. . . or that. It's great to go into the world, and even if it's things we've seen and done before . . .
. . . this time we saw and did them together. Since my first year teaching, we've painted dragons for Chinese New Year (February 3 this year). Many of the children arrive in class with an awareness of the Western tradition of dragons as monstrous, fire breathing, treasure hoarding creatures to be feared and slain, so I like introducing them to the Eastern idea of the dragon as a wise and powerful being, symbolic of all that is wondrous about life. We start by looking at Demi's Dragons and Fantastic Creatures , a book that is, shockingly, out-of-print. 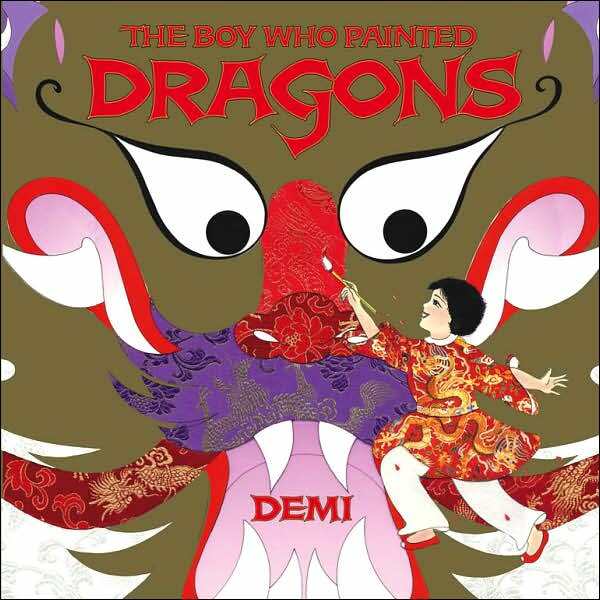 Demi's paint, ink, and Chinese silk brocade illustrations of dragons on pages that fold out to 3 and even 4 pages across capture the magic of these mythological figures in a way that never fails to spark preschoolers' imaginations. As we look at the Creative Dragon (it flows through your mind as you're painting), the Wind Dragon (it is moving the leaves in the tree outside our windows right now), or the Mountain Dragon (an old, wise, and very still dragon that lies within the mountains we see in the distance) I can see trepidation in the expressions of some of the children. After all, these are dragons: gigantic, mysterious creatures with sharp teeth and claws. They look fierce even while we're told they are good. As children paint we ask them to tell us about their dragon. Several of the girls painted rainbow dragons last week, using their paint brushes to claim ownership of these fierce beings. I've noticed that many children focus on painting the fangs, often applying so much paint that they wear through the paper, almost as if they're facing a fear. Long ago there was a young boy who painted dragons. He painted dragons on everything. The odd thing was that he did not paint dragons because he liked them; he did so because he was afraid of them, terrified of them in fact. Now, high up in the heavens the dragons who played and who "rode on the clouds and raced the sun" saw Ping painting his beautiful dragons. The Heavenly Dragon was so pleased with Ping's apparent fondness for dragons that he decided to pay him a visit. When Ping saw a real dragon the boy, in sheer terror, hid under a chair. Seeing the state of the boy the Heavenly Dragon realized that Ping "painted dragons out of fear." We used this story to kick off a discussion about our feelings and the feelings of others in our Pre-K class, continuing the work we've been doing on empathy these past several weeks. I find the dragon metaphor to be a particularly apt one for the situation in which some of our older boys find themselves. Naturally, they can identify with Ping, who of course, is petrified by the sudden appearance of a dragon in his bedroom. What I've been trying to do as well is help them draw a parallel between themselves and the dragons. Many of these older boys have been imagining themselves to be powerful, yet terrifying beings (e.g., superheroes, pirates, monsters), exploring this aspect of their masculinity, just as boys in every preschool classroom around the world are doing. It's almost a rite of passage, I think, this discovery of their power, then the struggle to learn to use these fierce "powers" for good. I asked the boys to consider that as they loop the younger children into their play, they may be dragons themselves, fearsome to people younger and smaller than themselves. I don't know if they "get it" exactly, but that's okay because the metaphor of mythology doesn't always work by direct means. I've already read the story to them twice, and I'll likely read it again. I want this story to become a touchstone for us for the rest of the year, a reference point for discussing our own feelings and the feelings of others. I've already asked one boy to consider, "Are you a dragon now? Or are you Ping?" He was confused at first, but after thinking, he decided he was a dragon. When I asked, "If you're a dragon, then who is Ping?" he knew exactly who I was talking about and, at least for the time, seemed to tone down the intensity of his play. When my daughter was a preschooler, people used to tell me that "girls are easy when they're young, boys are harder." I don't know if that's true or not, having never parented a boy, but I think at least part of what they were talking about is the problem with dragons. It must be quite frightening for parents to see their gentle, innocent babies begin to explore this aspect of being male. It's confusing with its sharp teeth and claws, it's size, fearsomeness, and power. It takes a lot of practice to learn how to be a proper dragon. Maybe it seems that they're too young for this, but it's at about this age, 3-5, that children begin to understand this most basic of "divisions" within humanity, the two genders, and come to understand to which "tribe" they belong. The same people who told me that girls are easy and boys are hard, would also warn me, "But in middle school, it's the boys that get easy and the girls that get hard." I haven't found the metaphor yet that works for me, but as I watch my 14-year-old baby exploring the power of her femininity I think I have a lot in common with the parents of these preschool boys. On Monday this week my friend and former Woodland Park parent Jean dropped by the school with a load of toys her boys had outgrown. It was quite a stash of cool "new" stuff for us to finish using. This picture doesn't even include all of it. Everything is a toy we'll put to good use, although, as always, it makes me wish for that warehouse to store it. We broke out the barn and pony set (with 12 different breeds of ponies!) for the Pre-3 class on Tuesday morning. But we saved the rest of the toys for the Pre-K group (9 boys and no girls this year) to break in on Tuesday afternoon. This is often the tactic I use with new or especially exciting activities: introduce them to the smaller group of older children first by way of letting a little air out of the "competition" for turns when the larger group is together. My initial instinct was to spread the toys around the class room, give the boys a chance to explore them, then come back together to make charts ranking them according to various criteria. But since we've been having issues with some of the boys' dramatic action play being too intense for some of the younger kids, I thought instead to try using them to work on developing the habit of thinking about our friends and how they might feel, following up on the work we did last week surrounding our celebration of MLK. The boys finished lunch to find all the new toys arranged as if on a shelf in a toy store, the caveat being that I'd placed a tape line on the floor across which no part of their bodies was to cross, not even a hand reaching out to touch something. This is a convention we establish early in the Pre-K school year because we sometimes work with sharp knives, flame, hot plates, and other potentially "dangerous" items that I don't want them to handle on their own. The kids learn to stand back and examine what is behind the line with their eyes first, assessing the risk. If there is an unknown liquid there, they might say, "That could be poison." On the other hand, most of the time they say something like, "Those are just stuffed animals, Teacher Tom, they're not dangerous." But they still know by now not to cross the line. It's a good exercise in self control. This was obviously just a collection of toys and, man, you should have seen how they crowded right up to the line to examine them. "What's that fire truck, Teacher Tom?" "I see a digger. It's a front loader!" "There's a space ship!" "Lincoln Logs! I have those at home." "Are we going to play with them?" When the boys had settled down, eyes still surveying the toys, I told them about Sam and Ian, how they had once been children at our school, how they'd grown up, and that they thought we'd like playing with some of their old toys. I said, "They were thinking about what you might like to play with." "First we're going to talk about them." It's sometimes a challenge to "just talk" in a group of nine 4-year-old boys, but I had their attention -- or rather the toys did. I then began going through them one at a time, demonstrating them. They named the toys, then I said, "I want you to think about our other friends in class, not your friends here in Pre-K, but the younger kids. Who do you think would really like to play with this?" I was prepared for them to take a lazy route and just keep naming the same child over and over. I was going to say, they needed to think of a different friend, but I didn't need to go there. As we methodically went through the toys one-by-one, the boys really seemed to be considering who among their classmates would get a special kick out of the various toys. They thought Violet, for instance, would like the pony play set, a natural given that she likes to wear her cowgirl boots to class most days. And they were pretty sure that Sylvia would like the dinosaurs, creatures for which she's often expressed an affinity. I complimented them each time for their thoughtfulness, emphasizing that I liked the way they were really thinking about how their friends might feel. "I think you're right, Connor will like playing with that. That's very thoughtful of you to think of him." The only problem with this exercise was that it was quickly eating up way more time than I'd anticipated. By way of speeding things up, I tried skipping a few of the smaller toys, but by then they wouldn't have it, so clock be damned we went through the entire collection. "Now," I said, "We get to pick one of these toys to play with together." At this, there was a lot of shouting and advocating and pointing. "I want to play with the digger!" "No, the tent!" "The space station!" Once we got back into taking turns by raising hands, we started once more wading through the toys. "We need to find a toy that we can all play with together, right?" They all seemed to agree with that, although Dennis piped up, "Or we could take turns." "That's true. We could pick a toy we can all play with together or we can pick and toy and take turns. For instance, what about the fire truck. How could we all play with the fire truck?" "Who gets the first turn?" Nine voices called out, "Me!" "Hmm, you can't all be first. How do we decide who goes first?" "Me!" "Me!" "Me!" Then Dennis said, "We could vote." I didn't do a very good job with this, but we kind of fumbled our way through to the idea that everyone would probably just vote for themselves and "What's a bigger number, one, one, one or one?" "They're all the same!" Well that won't work. My goal was to get them to move away from "me" and onto "we." "So it seems like we need to pick a toy that we can all play with at the same time." I then started through a process of elimination, going through the toys one at a time, asking, "Can we all play with this one together?" "We could all work together setting up the tent." "The Lincoln Logs have lots of pieces." "This Puzzle World set has 61 pieces and this one has 77. That's more than 100 pieces." Most were easy, being eliminated more on the boys' collective estimate of its lower play value, although some were more challenging to take off the table, like the fire truck. With some steering on my part, however, we finally narrowed it down to the 3 toys with the most to offer to large group play and the space station. This was our biggest challenge. There were only 3 space vehicles and 9 boys. They were good about insisting that they could take turns, but repeatedly stopped themselves when I asked them to consider who would get the first turn. We went around and around for quite some time, until finally Charlie L. said, "He can have the first turn and I can have the second turn." That was huge, but it only lasted a moment before other boys began to say they ought to have the second turn. Finally, and without reaching consensus, we removed the space station from the mix, with my promise that we would figure out a way to play with it next time. It was down to 3 toys from the two dozen or so we'd started with. We'd now spent at least thrice the time I'd planned for this activity and we hadn't even gotten around to playing with a toy. From here we went with Dennis' plan from earlier and voted. The Puzzle World sets edged out the tent, aided, I think, in large measure by Ariya's repeated and excited declaration, "That one has 61 pieces and that one has 77 pieces!" Ultimately, that was the deciding factor, not glamor, not action, not colors or TV commercials. We chose the toy with which we could play together based on it having enough pieces for everyone. By the time we were done, we'd consumed nearly 1.5 hours of a 2.5 hour class. Nine 4-year-old boys sitting on a blue rug doing the hard work of thinking about the other people. I feel like all I've been doing this year is writing about boxes. These are the top and bottom of a long box that came along with our giant tube (which I've still not had the courage to cut up into shorter pieces). Watching children play with boxes makes me want to write a poem about them. Or sing a song. These they seem to like to hide under, together, making it feel for a few seconds as if there are fewer children at school today. Then suddenly they burst back out into the light, bringing with them all the sound and motion that we expect at Woodland Park. I wish I had a huge warehouse for storing these kinds of thing, but instead we need to use them up, wear them out, then either get them into the recycling bin or cut them up for art projects, like this incredible glue collage on which we've been working off and on for a couple weeks. A project built on a remnant of the last box we loved until it was no more. A collage made of the parts of other things we've used up, but not found the heart to throw out. And then when we're finished gluing, once it's all dry, then maybe we'll throw it out. If history is to be a guide, it will take a long time before that happens. I might even go over it a few weeks from now and pick it like carrion for parts to re-use yet one more time. In fact, I'm pretty sure much of it will soon be stuck to the side of our new long boxes. But not before we've loved them to pieces. People worry a lot about what their children are learning, and it's an important thing to think about, but it is the habit of learning, the habit of thinking, the habit of practice, trial, failure and finally accomplishment that ultimately defines education. 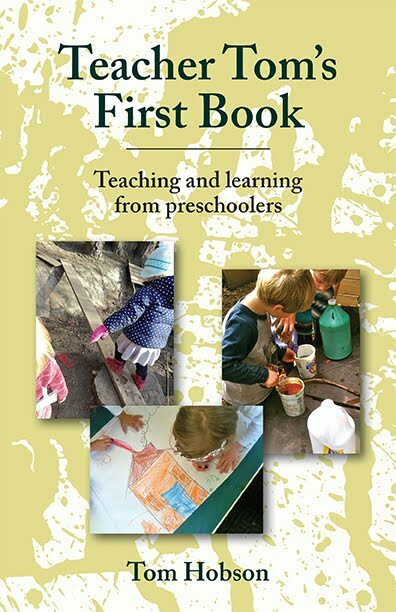 It matters less, I think, what specific competencies young children acquire, than it does that they develop the skills needed to acquire them. We start, perhaps by needing a helping hand, to hold the paper steady, for instance, but with practice we move on to doing it on our own, even casually, with our legs crossed. Often it's about mastering a tool because tools are one of the most important ways humans interact with the world. And there are always more tools to figure out, just waiting there until you're done mastering the last one. As adults we can see that gaining some competencies will come in handy as our children go forward. Those skills are so manifestly useful that we imagine our children someday putting them at the center of their lives as a hobby or even career. Other competencies that our children work so hard to acquire may not seem so useful to us. But it's rarely the skill itself, but rather the habit: the habit of achieving competency at this or that. After awhile, after doing it over and over with tools, toys, our minds, our bodies, our friends, we come to understand our own process of asking for help, thinking, tinkering, and practicing that leads to competence. And we learn to apply it over and over again, overcoming frustrations, falls, and failures. Knowing that these are all inevitable aspects of learning. We've fallen before so we always know we might fall. We've had bad times with our friends as well as good. And we come to understand this is the only way to where we want to go. We struggle to become competent . . .
. . . and once we are we take that new competency and try it out on the rest of the world. But ultimately it's not the specific competencies that matter, but rather the habit of acquiring them, the process, the hard work. And then we apply those habits to the world as it presents itself to us because we're confident that this is the way to get the most out of life. "But When You Hit Him, It Hurts Him." Am I An Old Fuddy-Duddy? "I'm A Master Giant Robot Builder"